A vast majority of Intel processors still use the older HD 2000 graphics, which don't work with the method in this guide. However, you can enable basic HD 2000 support on Mac OS X with this alternative guide. If you want to find out whether your Intel processor uses HD 2000 or 3000, you can Google the model of your processor. For example, if I search "Core i5-2500K" (my processor model) on Google, the first result is Intel's official page for the Intel Core i5-2500K. According to the "Graphics Specifications" section of that page, my Hackintosh's i5-2500K processor uses "Intel® HD Graphics 3000", which works with Mac OS X.
Additionally, your computer's motherboard has to support integrated graphics. For Intel's 2nd-generation processors, P67 motherboards are the only type of motherboards that don't support integrated graphics; the other three types of motherboards will work. For starters, you need to change a graphics setting in your computer's BIOS (which is essentially the settings page for your motherboard). Boot your computer, and enter the BIOS. To enter the BIOS on a Gigabyte motherboard, you have to press the delete key when it boots (before the operating system starts). Different manufacturers set different keys for opening the BIOS. 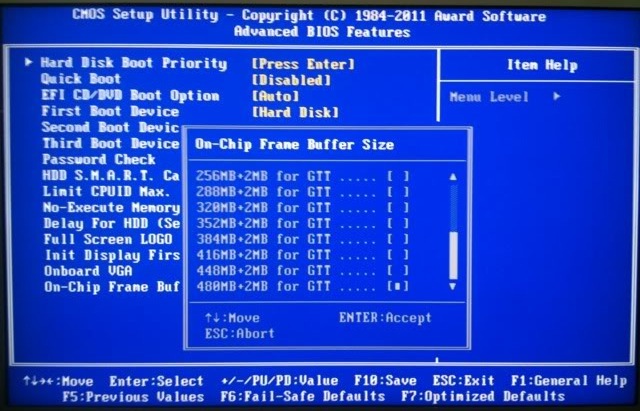 If you have a Gigabyte motherboard, there will be a setting called "On-Chip Frame Buffer Size", located in the "Advanced BIOS Features" page. This sets how much video RAM your processor's HD 3000 graphics will use. Motherboards from different brands might call this setting something else. If your Hackintosh has 4 GB of RAM, set video RAM to 384MB. If your Hackintosh has 8 GB of RAM, set video RAM to 480MB. Once you've set up the BIOS, proceed to the next step. NOTE: HD 3000 is not supported out of the box; after installing Lion, you'll have to make a few modifications before your screen will display at full resolution. Once you've installed Mac OS X Lion on your Hackintosh, install Chimera bootloader. 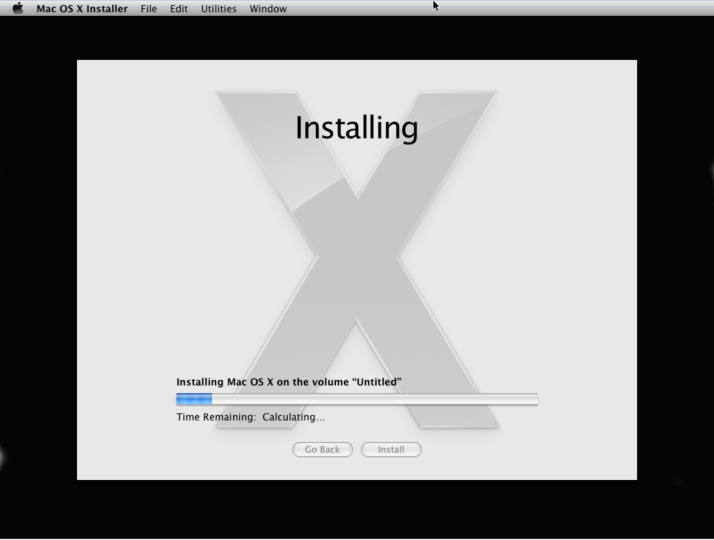 Chimera is a popular bootloader for Mac OS X, made by MacMan from tonymacx86. (A bootloader is the program that boots your operating system when your computer starts.) Easybeast and UserDSDT (available in Multibeast) both install Chimera. 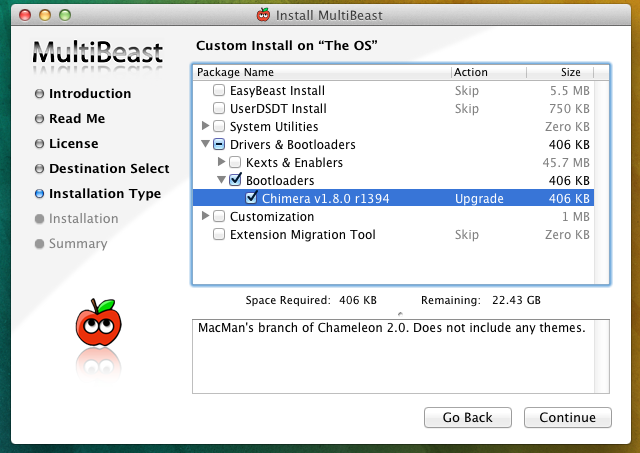 If you aren't using Easybeast or UserDSDT to enable booting from the hard drive on your Hackintosh, you can also use Multibeast to install Chimera bootloader by itself (the option is located under Drivers & Bootloaders -> Bootloaders in Multibeast). NOTE: You have to register an account on tonymacx86 to download Multibeast. Chimera bootloader injects the device ID of your HD 3000 graphics card into Lion's default graphics drivers, so that you can get graphics support without a hassle. 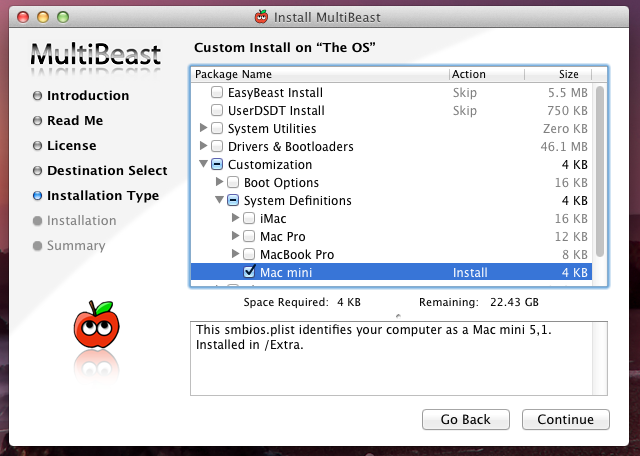 Finally, install the "Mac mini" system definition in Multibeast. System Definitions pretend that your Hackintosh is a real Mac. When Mac OS X Lion sees that your Hackintosh is a "Mac mini", which uses HD 3000 graphics, it enables the built-in HD 3000 drivers, which are otherwise turned off. You can also use the "Macbook Pro 8,1" system definition, though "Mac mini" is generally recommended. The VGA port on your monitor will not work (real Macs don't have VGA ports). You have to use either the DVI or HDMI port on your monitor to connect it with your computer. You may see occasional artifacts on your screen, but this is normal. You may be able to fix these artifacts by installing FakeSMC 4.2. And that's all there is to it. Your integrated Intel HD 3000 graphics should be fully supported now.